Break out your cupcake tins – it’s time to make Coconut Flour Cupcakes for the Royal Wedding. If Prince Harry and Meghan Markle are looking for a healthy coconut flour cupcake recipe – this is the one. We all know Meghan Markle loves clean eating, so I’m sure she would love sugar-free, gluten-free, coconut flour cupcakes. If they need a low-carb cook, I’m ready! Low-carb cupcakes are the perfect lunch box filler too … they’re almond flour free and only 4g net carbs. When we had cupcakes before living low-carb, we loved that the sweet taste coming from the cake and icing, and thought it was the best thing to enjoy for a snack or afternoon tea. But now, we realise just how much sugar goes into making them plus the carbs from the wheat flour – we wouldn’t be caught near the stuff! And don’t think a gluten-free cupcake is any better, in fact they can be even worse. Gluten-free flours are highly processed, and readily absorbed high carb flours. Read this article to see why gluten-free junk is still junk. That’s no problem though because I have a new cupcake recipe ready for you! And, as always, it’s low on carbs. Hurray! When ditching the carbs, we turn to almond and coconut flours for our baking needs. Coconut flour in particular is not only free from gluten and wheat, but it is also high in fibre, cheaper and lower in inflammatory omega 6. With the increasing number of allergies, more readers are asking for tree nut free recipes. And as many parents know, an increasing number of primary schools and kindergartens now have a nut-free policy for baking and school lunches. So many low-carb recipes that use almond flour/meal are off-limits for our school lunch boxes. TOP TIP: I have just added a new category for coconut flour recipes OR recipes where I give a coconut flour conversion. Take a look. Allergies – so many readers are requesting nut free recipes. Either because they have nut allergies, or like me, their children attend a school with a nut-free policy. So baking with nuts is out of the question. Cost – coconut flour is cheaper to use. Prices vary from country to country, and what is currently on sale, but for us in New Zealand, coconut flour is half the price of almond meal/flour. Not only is coconut flour cheaper to buy, the amount you use in a recipe is incredibly small compared to almond meal/flour. A cake may require cups of almond meal/flour, whereas a coconut flour recipe might only require 1/4 of this. Omega3/6 ratio – almonds have a high omega 6 (pro-inflammatory) content. This isn’t so important when you are just eating a few almonds as a snack, but to rely on cups of almond meal/flour for meals and baking, really does make a difference and adds up quickly. 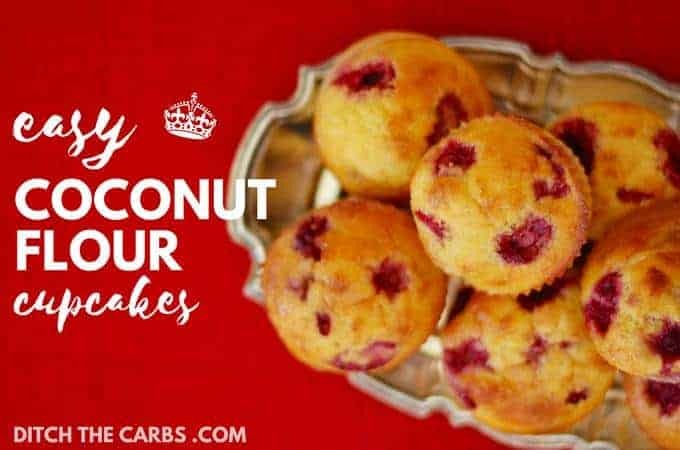 Since the texture of coconut flour is so light, you’ll be sure to make soft cupcakes with every batch. You might even have the ingredients in your kitchen right now! 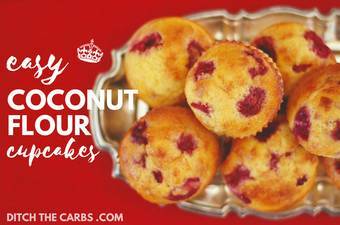 And one final tip, these easy coconut flour cupcakes recipe, can be adapted and made with any berry you choose. I love raspberries as they have a sharp taste and have less carbs than blueberries. So enjoy this simple recipe! My family sure did. Easy healthy recipe for coconut flour cupcakes. They are naturally gluten free, sugar free, grain free and prefect for portion control and packed school lunches. Mix together the melted butter, coconut flour, sweetener, vanilla and baking powder together until smooth. Add the eggs one by one, mixing in between each one. 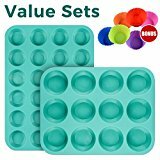 Spoon the cupcake mixture evenly between 8 cupcake cases or use a muffin tray. Press 1 or 2 raspberries evenly into each cupcake. Bake at 180C/350F for 15-20 minutes until each cupcake is cooked in the centre. Second time that I make them and I love them! Greetings from Mexico!!! Saludos! You do not say when to fold in raspberries, just to add 1 or 2 to the top? You can add them to the top, then poke them down into the batter with the end of a spoon or fork. If you mix them in, the cupcake batter will turn pink! Hi! Thank you for the recipe, I tried it but it was more like a breakfast egg tart than a cupcake. If I bake it again I will use less egg and up the flour. Just one main questions – can I decrease quantity of eggs? It is meaningful to use 8? It seems too much for me and too many eggs spend at a time… Thank you! I have just made these and added dark chocolate to them as well as the raspberries. Unfortunately they have not turned out very successfully. They have like a tough skin of egg around them. The centres are okay. I am a New Zealander living in Italy and can only think that the coconut flour I used is of a different quality. Libby thank you for taking the time to share your recipes and advice. I enjoy your newsletters immensely. Sorry no. These two flours are not interchangeable. This article will help explain “Ultimate guide To Almond Flour vs Coconut Flour”. Can I make one of these in a mug in the microwave? I’m afraid if I make 8 I will want to eat them all today, lol. Can these be frozen? I don’t want to eat them all at once, and I am the only one in the house eating clean. Thank you. Just made them now and I am really pleased with how they turned out. These cupcakes were delicious & I was very pleasantly surprised with them as I’ve done very little sweet baking since eating low carb. Should these be kept in the fridge or just in a caketin in a cupboard if not all consumed in the first sitting? Great question. I tend to keep coconut flour recipes for up to 3 days because of their high egg content. I keep them in the pantry in the winter, or in the fridge in the summer. I also keep them in an airtight container to keep them fresh. I have the same recipe but I use coconut oil instead of butter and only six eggs. Do the two extra eggs make it fluffier because mine are really good. I also add Lillys chocolate chips. I have the same recipe but I use coconut oil instead of butter and only six eggs. Do the two extra eggs make it fluffier because mine are really good. I also add Lillys chocolate chips. Hi Barbara please could you tell me if you used the same quantity of coconut oil as the recipe states for butter? I would like to try this option! Could you help, I can’t seem to make coconut flour work for me. I followed this recipe and it just turned out like a flavoursome omelette..
What am I doing wrong, is my coconut flour past its use by date do you think? Coconut flour does take some getting used to but I flavour mine heavily. The brand I buy has a very subtle coconut flavour, and from what I can gather from many of my American friends here, some brands are quite strong and more akin to desiccated/shredded coconut instead of true coconut flour. And hence they do not behave like coconut flour should i.e.swell and thicken. Maybe try another brand and see if that is more successful. I love coconut flour and use it all the time. So much cheaper and lower in carbs. Hi there … what granulated sweetener products can you recommend that are available here in New Zealand? Can I reduce the amount of butter? I made them last night! I didn‘t have any raspberries so, I took a few squares of 85% dark chocolate that I broke into small pieces and added to the cupcakes before baking. The cupcakes of my silicone form are smaller (I had a total of 21 cupcakes with the above ingredients) but I personally think that they have just the perfect size and also look awesome! How do they taste? DELICIOUS!!! 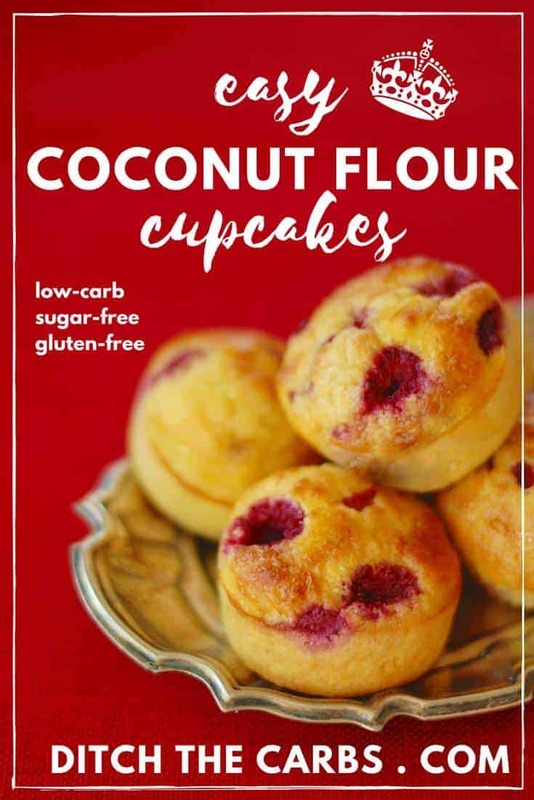 Thank you for this great and very easy recepie – low in carb, as there is only 1/2 cup of coconut flour and not too much sweetener, but plenty of good healthy fats. Best regards from Switzerland. 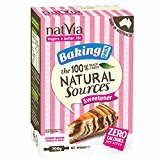 Hi can you recommend which is the best sweetener to use that’s available in the U.K.? I love this recipe as it is so versatile. Last time I added to the dough lemon zest and very little sweetener only 1 tbsp. After baking I mixed the juice of 1 lemon with 2-3 tbsp of powdered xylitol and poured it over the cupcakes while still hot and in the silicone form. Let the cupecakes cool down and absorb the juice. I like them cold, so I store them in the fridge. They turned out very good and juicy! … of course you have to like lemon! I have never tried that. I just use a lot of vanilla and there has never been an eggy taste for me. Or someone else commented her ether she added chopped 85% chocolate – yummm. Hi, I had a bunch of leftover egg whites in the fridge so I subbed in half the whole eggs for egg whites. It worked really well! I also added a couple of squares of 85% chocolate as suggested which tasted really good. Nope, it is correct, it only requires 0.5 cup (half a cup). If you have never used coconut flour before, you will be ah-mazed at how far it goes. Read this article, it explains everything. what is 0.5 cups? i see you say that in your directions? 0.5 = 1/2 cup. Others got confused as to what 1/2 meant so I used the decimal so it was clear. I love your recipes but since I live in the US, I don’t know how to compute your grams to cups for measuring. Do you have some kind of chart for me to use? YES 🙂 Simply press the large red buttons below etc recipe and magically it will convert between grams and cups so you can choose which one you prefer. Welcome Carol, I hope you find some yummy recipes to try. Hi, Morrison’s & Holland & Barrett sell it but it is cheaper to buy on line from amazon or eBay. Hope that helps. Lidl have also been selling coconut flour too recently.